Eric and I have been rooting from the sidelines for someone – anyone, really – to fight back against Robin Ficker’s indecorous attacks on Amie Hoeber (and other candidates) and her career spent defending our country from nuclear, chemical and biological attacks. A Miner Detail has taken on Robin Ficker on more occasions than we can count, including the unforgettable Cumberland debate where I verbally fought back Ficker’s attacks from the audience, but it’s especially nice to watch a candidate and/or her supporters call out Ficker for the absolute sham campaign that he is running. Last week, Ficker revved up his social media heckling with his typically insufferable spammy posts in multiple Republican Facebook groups. Ficker knows he’ll never beat Hoeber in a Republican primary, so he takes to Facebook to attack her. Not to mention, Ficker placed his ugly campaign signs in illegal locations quite literally next to Hoeber’s signs in Washington County. Nobody actually takes Ficker seriously except Ficker himself. But in this particular attack, Ficker crossed a line on Hoeber that is worth reporting. Eric Beasley’s article, “Robin Ficker Flubs another Anti-Hoeber Foray,” completely annihilated Ficker’s ridiculous Facebook harangue against Hoeber. We don’t need to expound any further. Hoeber doesn’t respond to Ficker’s ongoing social media vituperations. How does the ol’ idiom go? Don’t wrestle in the mud with a pig? You both get dirty. Or something like that. Hoeber doesn’t wrestle with pigs. And no amount of lipstick is going to make a pig look any better. But Hoeber’s surrogate Lieutenant General Max Noah (Ret), who appears in a Hoeber campaign ad that features a mosaic of retired generals emphatically endorsing Hoeber’s congressional candidacy, agrees that Ficker’s attacks are appalling. I stand with a long line of senior military officers who proudly endorse Amie Hoeber for Congress in Maryland’s 6th District. As the Comptroller of the Army, I saw first hand that Amie has the strength, experience, and leadership skills that we need in Congress. And in this campaign I’ve seen her determination to focus on the critical issues our country faces: our national and homeland security, the economy, and the proper role of the Federal government. For these reasons, I urge you to support Amie in the Republican primary on April 26. Today I am also asking you to join me and help Amie succeed in her mission. Just over the last week, the attacks on Amie have grown. 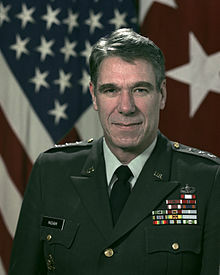 One of her opponents even attacked Amie for not being in the uniformed military during the Vietnam War. As a Veteran, I was appalled at this clear sign of desperation. What this opponent obviously did not know is that during the Vietnam War, Amie was already working at the Pentagon on projects related to homeland security. I know that Amie will not campaign in this manner. She will continue to focus on the big issues and on the people of the 6th District. The only way to counter such attacks is to get Amie’s message to more people. I hope somebody mentions Ficker’s spotty military record at the next Republican debate in Garrett County, as Eric Beasley alluded to in his recent article. When you ask Robin Ficker why he was thrown out of West Point in 1963, he’ll fire back with some greasy, slimy lawyer roundabout answer that he was appointed by a western Maryland congressman and attended the military academy for 30 months. Except West Point is longer than 30 months – it’s a 47-month experience. Robin Ficker won’t tell he was thrown out of the esteemed military academy for the same behavior he exhibits in this congressional race. Incidentally, did Robin Ficker serve in Vietnam? Did he see any combat after he was thrown out of West Point? With his own questionable military record (Eric Beasley is still uncovering the missing pieces), why would Ficker condemn Hoeber for not serving in a military unit? Ficker is a hypocrite. He won’t dare tell anybody why he left Army as a PFC in 1966. I’ve heard from several high-ranking military officials who believe Ficker may have received some special treatment; however, this is only conjecture and not a proven fact. Just remember, we have only 26 more days until Maryland’s April primary. 26 more days to endure Robin Ficker’s public buffoonery. Then, I presume, it’s onto the next campaign cycle for Ficker. Then the next. Then the next. Then the next. Ride a painted pony, let the spinnin’ wheel spin.